Andreas Boehler <andreas@aboehler.at> committed rMD3b40572761ba: Improve logging, try to fix a few bugs..
Andreas Boehler <andreas@aboehler.at> committed rMD5ea0a95ad490: Port to logging module and increase timeout. Andreas Boehler <andreas@aboehler.at> committed rDAVCAL851026a13c75: Update PlugIn Info. Andreas Boehler <andreas@aboehler.at> committed rDAVCAL4aeddad04e3b: Update fullcalendar to 3.7.0 and remove the translations for jQuery datetime..
Diffusion closed T50: Localization is wrong and overwrites jQueryUI datapicker as Resolved by committing rDAVCAL4aeddad04e3b: Update fullcalendar to 3.7.0 and remove the translations for jQuery datetime..
Andreas Boehler <andreas@aboehler.at> committed rMD25e064646e24: Update PKGBUILD. Andreas Boehler <andreas@aboehler.at> committed rMDfe91ec06d413: Fix loading/applying settings. Andreas Boehler <andreas@aboehler.at> committed rDAVCAL81332090f764: Event Management WiP. Andreas Boehler <andreas@aboehler.at> committed rDAVCAL42ccc183adf9: Try to fix some XSS vulnerabilities, ref T51. Diffusion added a commit to T51: Lots of XSS vulnerabilities: rDAVCAL42ccc183adf9: Try to fix some XSS vulnerabilities, ref T51. andreas added a comment to T50: Localization is wrong and overwrites jQueryUI datapicker. andreas added a comment to T51: Lots of XSS vulnerabilities. Thanks for your comment, much appreciated! It should be fixed now, would you mind having a look again? Andreas Boehler <andreas@aboehler.at> committed rDAVCALfba5a06844d8: Try to fix some XSS vulnerabilities, ref T51. Diffusion added a commit to T51: Lots of XSS vulnerabilities: rDAVCALfba5a06844d8: Try to fix some XSS vulnerabilities, ref T51. Andreas Boehler <andreas@aboehler.at> committed rDAVCARD7ddcc8b498be: Try to fix XSS vulnerabilities, ref T51. Diffusion added a commit to T51: Lots of XSS vulnerabilities: rDAVCARD7ddcc8b498be: Try to fix XSS vulnerabilities, ref T51. 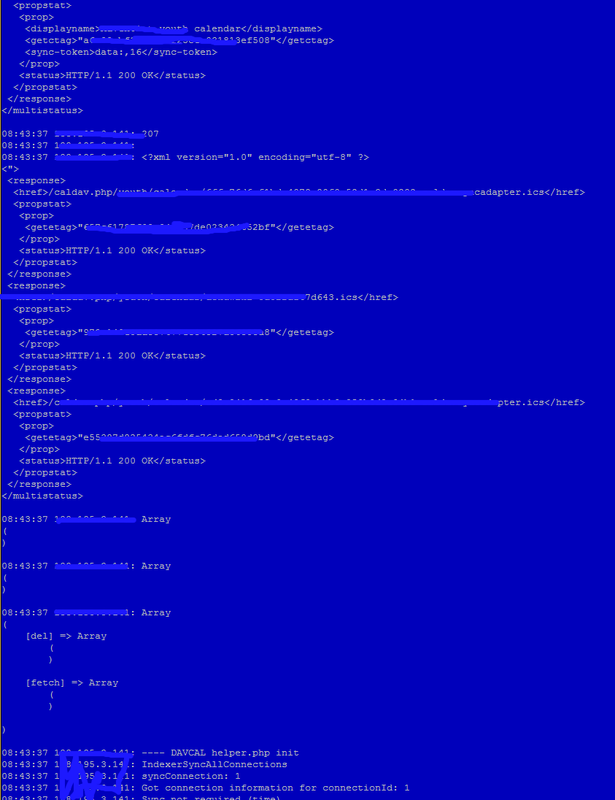 andreas claimed T50: Localization is wrong and overwrites jQueryUI datapicker. Andreas Boehler <andreas@aboehler.at> committed rDAVCAL736206e8267f: Event management WiP. Andreas Boehler <andreas@aboehler.at> committed rDAVCAL44f79c6fb95f: Fix language in datetimepicker, ref T50. Diffusion added a commit to T50: Localization is wrong and overwrites jQueryUI datapicker: rDAVCAL44f79c6fb95f: Fix language in datetimepicker, ref T50. 19blue85 added a comment to T49: davcal Plugin for dokuwiki Release 2017-02-19e "Frusterick Manners" don´t display inputs. Perfect now it works again :) I thought i made a mistake. andreas added a comment to T49: davcal Plugin for dokuwiki Release 2017-02-19e "Frusterick Manners" don´t display inputs. No problem, I introduced a nice regression - I should definitely do more regression testing before pushing updates! Anyway, please try the latest update published just now. The problem was/is the "C:" in <C:calendar-data> which confused the XML parser - I fixed it in 447fc5d456c1. I'm sorry to hesitate you again. Today i was working on the dokuwiki and recognised, that the plugin still dont work. I updated the webdav plugin but nothing changed. andreas closed T49: davcal Plugin for dokuwiki Release 2017-02-19e "Frusterick Manners" don´t display inputs as Resolved. OK, I'm glad you got it working. I'm pushing an update anyway just now, since you discovered a bug with this broken XML tag. I updated davical from version 1.1.3 to 1.1.5 about backport package made a resync and now I see the data. So I guess there where changes made for debian stretch. Thanks for the quick response. Obvisily nothing changed i deleted brwoser cache etc. Do you need access to my system? This might fix it, if not, we need to find another solution. andreas triaged T49: davcal Plugin for dokuwiki Release 2017-02-19e "Frusterick Manners" don´t display inputs as High priority. Thanks, that is the relevant part. The function clean_response messes the response up when davical is used (I only test against Sabre/DAV resp. NextCloud). It might take a bit until I come up with a solution, but I'll make that a high priority task. This is helpful, although webdavclient doesn't seem to log the raw response. There seems to be an empty tag <''> which is closed by </multistatus> and that probably confuses simplexml_load_string(). here is the output. do you need more? Hm, seems to be related to davical. Unfortunately, I can't test this since I do not have a davical installation. Please enable debug logging and force a sync. 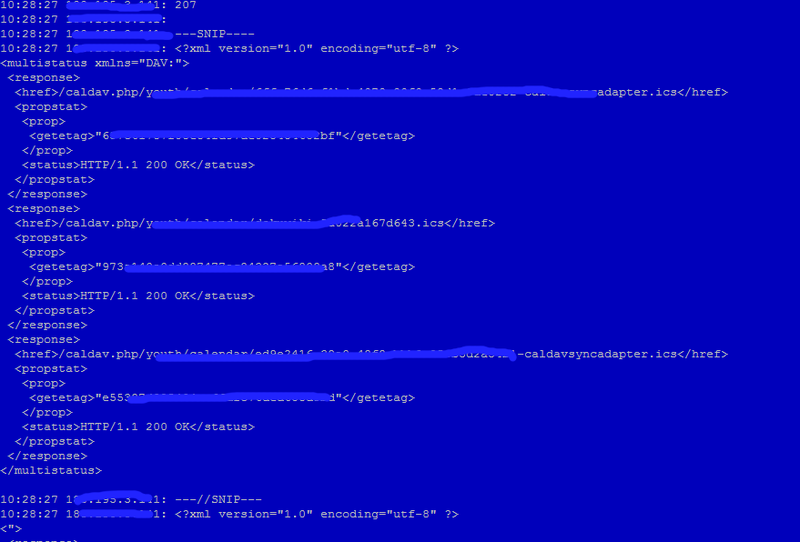 Then, you should be able to see some XML output in the debug log - be aware that your calendar data is included here! andreas claimed T49: davcal Plugin for dokuwiki Release 2017-02-19e "Frusterick Manners" don´t display inputs. What exactly are you trying to achieve? You want to synchronise your DokuWiki calendar to davical, right? Did you configure WebDAV connections in the Admin section? If so, were you able to display the available calendars? 19blue85 created T49: davcal Plugin for dokuwiki Release 2017-02-19e "Frusterick Manners" don´t display inputs. Andreas Boehler <andreas@aboehler.at> committed rMDa7d8bf05ba5c: Fix working with disabled outputs. andreas added a comment to T48: Auth no required. algorys created T48: Auth no required. Andreas Boehler <andreas@aboehler.at> committed rMDd5ff2ffd8601: Add Settings GUI and license. Andreas Boehler <andreas@aboehler.at> committed rMD108fa5a01e42: Add autostart load/apply and grace period. Andreas Boehler <andreas@aboehler.at> committed rMDad12a4fdf805: Fix TrayIcon, add PKGBUILD and icons. Andreas Boehler <andreas@aboehler.at> committed rLTPRESe978b7d6ed0b: Fix empty icon in SystemTray. Andreas Boehler <andreas@aboehler.at> committed rMD836eaac1d216: Add eric configuration. Andreas Boehler <andreas@aboehler.at> committed rMD632a21b1145a: Implement basic configuration applying - untested. Andreas Boehler <andreas@aboehler.at> committed rMD7676764d048a: Initial commit - applying configuration missing. Andreas Boehler <andreas@aboehler.at> committed rDAVCAL289b4fc06c1a: Make private URLs more secure, thanks to jvoisin. This fixes T46..
Make private URLs more secure, thanks to jvoisin. This fixes T46. Diffusion closed T46: Please don't use `uniqid` as Resolved by committing rDAVCAL289b4fc06c1a: Make private URLs more secure, thanks to jvoisin. This fixes T46..
Andreas Boehler <andreas@aboehler.at> committed rLTPRESd94d916979ef: Make compatible with Okular's presentation mode. jvoisin added a comment to T45: Please document how to run it under nginx. jvoisin added a comment to T46: Please don't use `uniqid`.